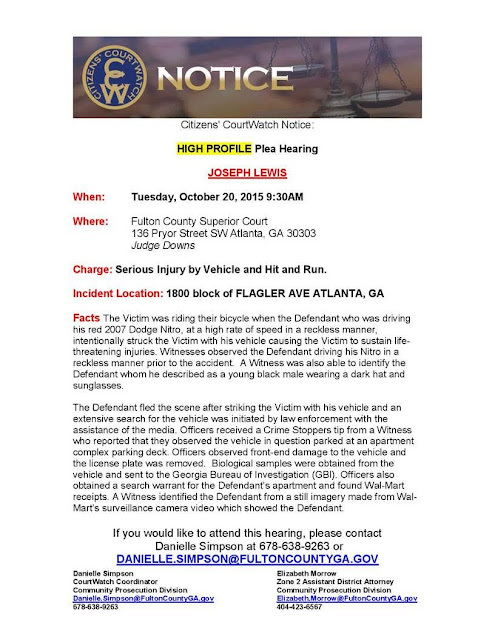 As some may remember Joseph Lewis is the suspect who ran down Cyclist Greg Germani and them fled the scene leaving Germani seriously injured. This is the final plea hearing before trial begins on November 1st. Anyone who is interested in CourtWatching this case see the details in the attached photo, and contact Danielle Simpson, JD. Ms. Simpson tells me that it is likely the victim, Mr. Germani, will testify, so community impact statements may not be required or allowed. However, it never hurts to show strong community support for the victim and for making sure that this suspect receives the penalty he deserves!